Taponen did not have the best game. He only had 14 saves in 2-4 loss against Pelicans. You could not blame the goalie for giving up those goals, but with better read of play he might have been able to stop one or two of them. I thought he looked pretty good overall. He was technically sound and did good job finding the puck. Reactions and reflexes seemed pretty good too. His quickness is above average, but I thought he gave too much room in the upper corners his stance being bit too low occasionally. However while he looks good overall, I couldn’t see too many really interesting qualities. With his size, I would have liked to see bit more impressive performance. That being said, he is for sure one of the most interesting Finnish goalies from his age group. Taponen was stable in net for the Finnish team throughout the tournament. The game against USA was his best performance, as he made 35 saves and gave his team a chance to win, despite the Finnish team getting clearly outshot by the opponent. 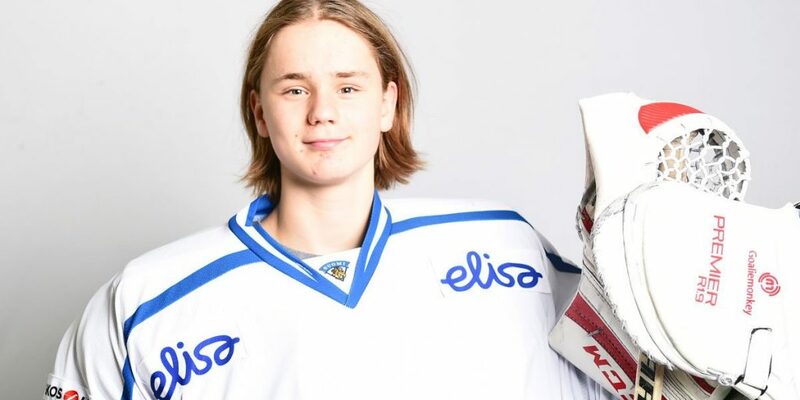 The Jokerit U18 goalie seems to most often perform at his best when carrying a heavy workload. While he did allow a couple of soft goals in the tournament, he was able to bounce back quickly. Taponen is an extremely quick and flexible goalie. He showed quick lateral movements and he moved effectively post to post. His glove hand was quick and consistent. His rebound control was a bit of an issue at times, but he was quick to recover loose pucks. He displayed quick reactions and reflexes. He stopped pucks properly behind the net and he handled and moved the puck well most of the time. Taponen doesn’t have the prototypical size of today’s goalie, but he does have NHL potential given his great quickness, athleticism and ability to perform well in pressure situations.